Last Monday (July 10th) was my husband Jim's birthday. We spent the day before grilling food, sipping drinks, playing music, and chatting with loads of new friends. 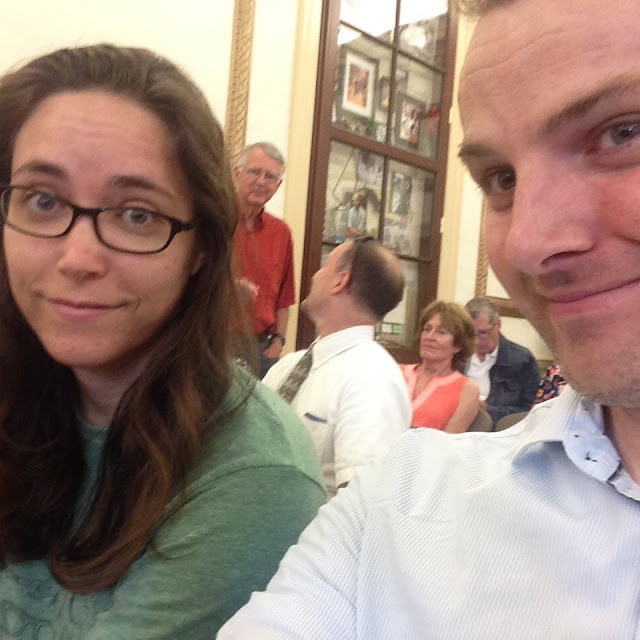 Then, on his birthday, Jim and I went to our local city council meeting. Jim got up, during the questions and comments segment, and expressed his concern about the way the city government tracks and reports city wide greenhouse gas emissions. It was exactly how he wanted to spend his birthday. I look a bit like I'm confused about his birthday activity in this photo, but in all honesty, I'm feeling guilty for not sending him an online love letter the way I've done for many years. It felt very right and important to be where we were, though. I didn't send him Facebook or Instagram love notes on his birthday either. (To be honest, I'm very inconsistent with wishing anyone happy birthday online, anyways.) He doesn't need the expression of my love in the form of social media. He's thankful of course, but the etiquette of the internet is not something he particularly cares about. It's gotten me thinking a lot about lifestyle blogging and internet etiquette though. The way I saw it was if the internet is your hobby then you're free to come and go as you please and you don't really owe anyone anything there, apart from your main communication and upkeep of friendships. (If I don't wish you happy birthday online, it's not a personal attack.) That's how I see it anyway. I may log out, take social media breaks, and not feel the pressure to "keep up" with it all, all the time. What does that mean for this blog though? If you're here you're either a friend or family member looking to keep up with my life or someone who I may not know but enjoys what I write. (Either way, I'm grateful you're here.) This blog has always been a hobby that has maybe paid for a coffee or two in total over the years. Once I started working for myself, however, I started to evaluate my hobbies in terms of what could contribute to my income. I experimented with more "branded" blogging ideas and then I stopped blogging completely. A blog of mostly personal updates and "lifestyle" posts was a hobby I couldn't afford anymore. My mental health was suffering and I'm only now really starting to understand all of that. After I we moved to Maryland, I thought I'd be able to jump back into this blog easily. Instead, I stopped, which also resulted in never posting our wedding photos, honeymoon photos, the photos from many of my trips to Europe, and many other things. I've said before how much I want to change that and catch up but it never happened. I got in my head, thinking no one cared and maybe no one really does to the degree I do. But as a part of dealing with my mental health, I'm going to finally get started. One of the few ways to naturally boost serotonin is remembering happy events. So get ready for my happy memories and please forgive that they are not in real time.